Broward College was faced with the challenge of retrieving up to 10 student records, up to 20 pages each, per day. These records date back as early as the 1970s and are stored on archival media, both microfiche jackets and 16mm roll film. Often times the images are not clear and multiple prints, wasting time and paper, are necessary to get a legible print. Advanced Filing Systems proposed new microfiche/microfilm storage and upgrading to a new microform scanner. The new scanner is capable of scanning, digitizing or printing from all types of microform media: 16mm roll film, 24 x 48 microfiche and 35mm aperture cards. The scanner allows the end user to enhance an image, white out background noise or increase the DPI. Rather than printing every image, the end-user can e-mail the records directly to the requestor, thereby saving time and supply cost. The new system allowed Broward College the advantage of instituting new technology, while enjoying the benefits of an old analogue technology. Definitely, the best of all worlds. 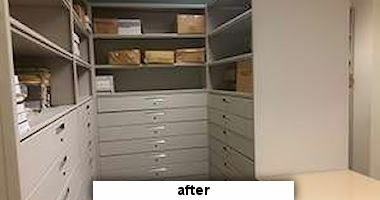 The newly designed storage room takes full advantage of the wall-space, allowing storage for additional media in open shelves, while microfiche jackets and roll film are stored in drawers. The solution cost was $31,000.00 rather than in excess of $400,000.00! For 25 years, Advanced Filing Systems has been praised for providing effective storage & filing systems to large organizations such as the US Navy, US Coast Guard & US Postal Service. 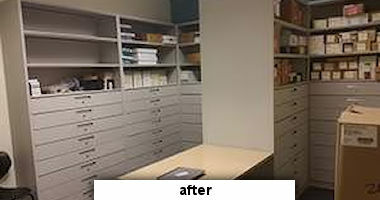 Our mission is to reduce the footprint of your physical space with innovative storage solutions, products and services.